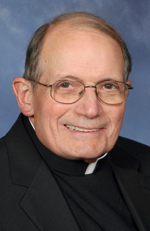 Father Gavin W. Muir, 81, pastor of St. Lawrence Parish, Riegelsville, died May 15. Born in Philadelphia, the son of the late David F. Muir and the late Frances (Murphy) Muir, he attended St. Francis of Assisi School, St. Joseph Preparatory School and St. Joseph’s College before entering St. Charles Borromeo Seminary. He was ordained May 22, 1965 at the Cathedral of SS. Peter and Paul by Archbishop John Krol. His first assignment was as parochial vicar at St. Rose of Lima Parish, North Wales. He also served at St. Francis de Sales, Lenni; St. Rose of Lima, Philadelphia; Most Blessed Sacrament, Philadelphia; St. Kevin, Springfield; Our Lady of Lourdes, Philadelphia; Nativity B.V.M., Philadelphia and St. Madeline, Ridley Park. In 1995 he was appointed pastor of St. Irenaeus, Philadelphia and in 2002 pastor of St. Lawrence, the furthest north parish in the archdiocese, possibly the most rural and 10 miles from the next nearest diocesan church. He loved it. Bishop Timothy Senior knew Father Muir from childhood, and commented, “his priesthood and ministry has certainly influenced the path of my own vocation. “Father Muir’s first assignment was to my home parish, St. Rose of Lima in North Wales, at a time of great growth — for the church and the parish — following Vatican II. Father was close to our family during those years — he heard my first confession and was present for my first holy Communion Mass — and we remained in contact throughout his life. “He was one of the most laid-back people I ever knew,” said Father Charles Sullivan, who first met Father Muir when they were young seminarians at St. Charles Seminary. They remained life-long friends often vacationed together. “I’ll be the homilist at his funeral and I’ll base it on a Latin phrase ‘Durum Patienta Frango,’ which means, ‘I overcome difficulties by patience,’” said Father Sullivan. One hobby Father Muir picked up during his ministry was horseback riding. “He loved horses,” Father Sullivan said. “I think he began riding horses when he was at Our Lady of Lourdes,” said Msgr. Paul DiGirolamo, another longtime friend. He did have a couple of disastrous falls and had to stop riding. But mostly Father Muir “was a very deliberate and thoughtful man,” Msgr. DiGirolamo said. There will be a viewing for Father Muir on Thursday, May 24 beginning at 9 a.m. at St. Lawrence Church, followed by his 11 a.m. funeral Mass celebrated by Bishop Senior. Among the concelebrants will be Msgr. DiGirolamo and Father Sullivan. Father Muir is survived by his sisters, Barbara Biancucci and Sister Beth Muir, SHCJ, and nieces and nephews. Interment will be at Riegelsville Union Cemetery, Riegelsville.